The great thing about natural stone floors is that they can be restored. High traffic and heavy use may dull your marble, chip your travertine, or damage your slate, but regardless of the stone and situation, replacement likely is not necessary. At Stone Makeover, we can restore your marble, travertine, and limestone floors to their like-new condition. Scratches? No problem. Etching? Consider it gone. Uneven tiles? We make lippage (uneven tiles) disappear. We can eliminate damage along the surface, polish, then apply a sealer to make it easier to clean and keep stains at bay. Color enhancing sealers can bring out the color of your stone, especially if you have slate or travertine. If you have a matte/honed finish on your marble, travertine or other stone floors, but always wanted them to be shiny—or vice versa—we can change any finish to whatever your heart desires. Trust your natural stone and tile floors to the professionals at Stone Makeover. The results are guaranteed to be dramatic. Check out our Before & After Portfolio to learn more about our amazing work. 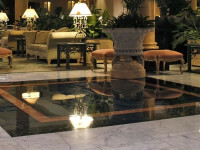 Looking for residential or commercial marble, limestone, or travertine floor polishing, honing, and repair services in New Jersey or New York City Contact us online or call (800) 661-7866 today to discuss your needs.